Highland Memorial Park allows the use of Bronze Grave Memorials only to mark graves. This type of grave marker contributes to the park-like atmosphere and allows for more efficient maintenance of the grounds. 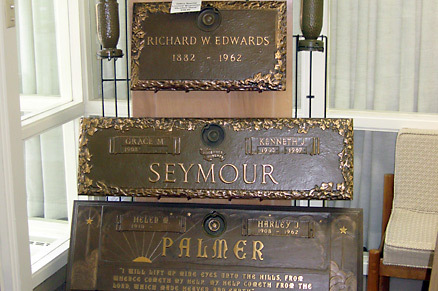 Highland Memorial Park offers Bronze Grave Memorials in a variety of styles and sizes. There are types for an Individual name and also Two Name versions. You may also choose to have a Bronze Grave Memorial mounted on a beautiful Granite Foundation. We offer two colors: Moonlight Gray and Canadian Mahogany. Both add a polished border around the memorial. Bronze Grave Memorials may be purchased with no interest financing for a period of up to 3 years in some cases. Please contact our office for details. Our prices range from $1,530 - $3,550 for Individual Memorials and from $2,925 - $6,055 for Two Name Memorials. In most cases, the above prices include all inscriptions, a built-in flower vase, a concrete foundation, installation, future inscriptions (if needed) and a deposit into the Highland Memorial Park Bronze Memorial Endowment Care Trust Fund. In addition to our standard line of memorials we are proud to offer the Lasting Memories Montage Memorials, which allows our families the option of designing 'one of kind' memorials using the photos of their choice. Please ask us for more details about the Lasting Memories Montage Memorials.